Offering access to shared bathroom facilities, some rooms are located in the historic stables originally built by the Lanarch family. Other rooms feature a private bathroom and are located in the lodge itself. 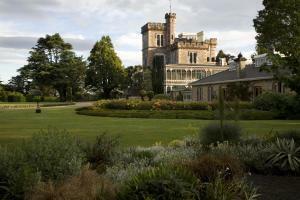 Accommodation includes entry to Larnach Castle, breakfast the following morning served in the historic stables, and access to the Castle Gardens. Breakfast is served in the historic stables, while guests can reserve a traditional New Zealand style dinner in the castle’s dining room. Larnach Castle is located a 20-minute drive from Dunedin city. Important Information: Please note that guests arriving later than 22.00 must contact the property prior to arrival to arrange for an after hours check-in. Contact details can be found in your booking confirmation. Please note that dinner reservations and menu choices must be made before 17:00 on the day of dining.